Located on Hang Trong street, one of 36 streets in Hanoi Old-quarter and is packed with shops selling handicrafts, silks and art. Pho Nha Tho, a two minute walk, is a great little – street for an afternoon drink at La Salsa and some traditional Vietnamese fish fare at La Brique – The Cha Ca (fried fish in banana leaves) is sensational. 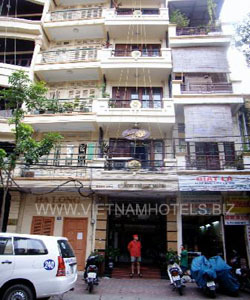 Just 5 minutes walking from the Hotel, The guests can go to some places such as Hoan Kiem lake – Ha Noi flower basket, well-known place with Tortoise Tower, Ngoc Son Temple, The Huc Bridge….Trang Tien plaza – a big shopping centre in Ha Noi, the visitors can come to Opera House and Water-puppet Theatre as well…. From the moment, one walks into the hotel, it is obvious that this place has been designed by someone who knows what he’s doing. The foyer is all soft light, Asian angles and artwork, from abstract oil to beaten copper and plazed pottery. The arty theme extends up the staircase, and into the 51 rooms. Each room has wooden floor, striped silk on the beds, funky rice-paper light shade and art aplenty. They also have internet access and air – conditioning. Rear rooms don’t have much of a window, making the front rooms with banconies a better bet. The best is room 777, which has a large terrace where guests can take a sit and take in the trees and rooftops of the Old – Quarter. If it’s not available, guests should take the lift to the roof for panoramic views, enjoying many kinds of food, beverage which made by talented and experienced Chef, Bartenders, melodious and romantic music, seeing the city views at night. What is a fantastic! 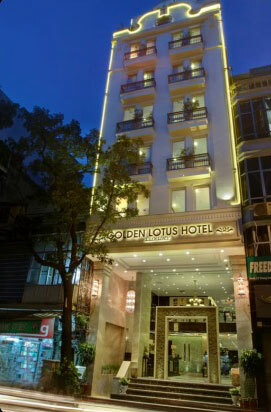 With the convenient location, special designing, multiple sevices and well-trained staffs, Golden Lotus Hotel is interesting and reliable address for both business and leisure travellers. Bar and restaurant: Guests can enjoy the wide range of mouth-watering Western, Asian and Vietnamese cuisines at the hotel's restaurant or relax and enjoy a panoramic view of Hoan Kiem Lake and Hanoi Red River from the bar and lounge located on the top floor. Business centre: The hotel's business centre offers secretarial, translation, photocopying, courier, fax, internet and email services. The receptionist will be able to help guests who need any assistance. Airline reservation and reconfirmation: The back section of the Service Directory has a list of airline reservation offices. Those who require assistance for reconfirmation of flights need to contact the Reception. Airport transfers: NoiBai International Airport is a 40-minute drive from the hotel. To make arrangements for transportation, guests need to please contact the Reception. Baby-sitting: A baby-sitter is available upon request; with a six-hour advance notice. Guests need to contact Housekeeping for this service. Baggage service: Guests need to contact the Concierge for storage or pick-up before departure. Credit cards, credit arrangement and cheque encashment: In settling accounts, the Front Office Cashier accepts travellers' cheques and credit cards such as American Express, Visa International and Master Card. To establish other credit arrangements, guests need to contact the Accountant. The hotel does not accept personal cheques in settlement of accounts or for encashment. Car rental: For chauffeur-driven cars, vans or taxis, guests need to contact the Reception. Laundry, dry-cleaning and ironing services: Clothes that are collected before 9 am are returned the same day at 8 pm. If, however, clothes are collected after 9 am, then they are returned the next day by 11 am. Mail and message: Guests are notified about incoming mail, message and facsimile. For enquiries, guests need to contact the Reception. Mini bar: Each room is equipped with a mini bar. Guests are requested to refer to the price list in their rooms and mark the items consumed. This list is to be handed to the Reception at the time of departure. The mini bar items are replenished daily. If guests require additional items, they need to contact Housekeeping. Newspapers: Local and foreign newspaper editions are available at the Lobby. Parcel service: Guest need to contact the Reception for more details. Sightseeing tours: A selection of tours around Hanoi (and beyond) is offered by several tour companies, information for which is available at the Information Desk. Limousine service: Guests need to contact the Information Desk for this service. Wake-up call: Guests are requested to inform the operator or the Reception of the exact time they wish to be woken up. Note: Pets are not permitted in the hotel's premises.